Concluded last October with its 25th issue, Kieron Gillen and Salvador Larroca’s Darth Vader was the high point of Marvel’s Star Wars line. As the arch-villain muddled through Empire middle management after the destruction of the Death Star (chronologically positioned after the end of A New Hope), he assembled a secret team with the help of rogue archaeologist Dr. Aphra—a gender-swapped version of Indiana Jones. Aphra’s life purpose was to resuscitate droids deactivated due to being too violent, including C-3PO and R2-D2 evil analogues Triple Zero and Beetee. Triple Zero was a murderous hoot: picture C-3PO with a spine and a needle for extracting blood. The series also featured a bunch of bounty hunters, including Black Krrsantan, a Wookiee who made Chewbacca look like a maltipoo. Now the whole gang (minus Vader, who—Spoiler Alert—believes the good doctor dead) is back for Doctor Aphra, as Gillen teams up with artist Kev Walker for a new ongoing that’s funny as hell, with the promise of fast-paced adventures and a deeper exploration of the main character—the first Marvel Star Wars creation to earn her own starring series. The first issue plays up the aforementioned Indiana Jones archetype from the start, providing a solid introduction for anyone new to the character. After recovering a rare artifact, Aphra makes a revealing comment: “Stealing—I mean recovering—something that can’t be used to kill people is kind of novel.” Much as he did in Darth Vader, Triple Zero steals the show with his polite, murderous ways. Gillen’s dialogue is as witty as ever and includes a bathroom euphemism fans will be quoting for years to come. While the realistic art of Larroca will be missed, Walker’s work is energetic and crisp, with a glint of humor. Like Darth Vader, this comic is really funny. This could be a problem. A lot of Marvel series have a humorous tone and not much else going for them; after an issue or two of say, Howard the Duck or Rocket Raccoon, you get the idea, and there’s little need to keep reading. 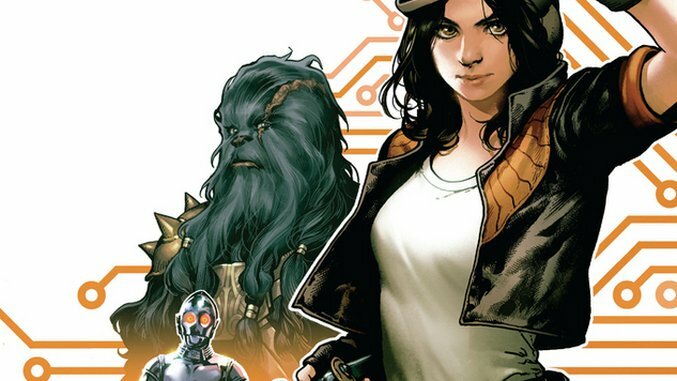 But there’s reason to think Aphra will turn out better than Marvel’s fluffier efforts: the humor is much stronger than average, and Gillen is taking positive steps to deepen the character of Aphra, building conflicts involving her academic credentials, business partners and a character I won’t spoil. If Aphra becomes more than a cheery rogue, this could end up being a hell of a series. Even if she doesn’t, this is can’t-miss stuff for anyone who likes their humor—and protocol droids—dark.